Precision Series rectangular waste receptacle is designed with refined gravity swivel door precisely weighted to self-close therefore conceal waste and odor. Efficient sleek contemporary design affords innumerable applications. 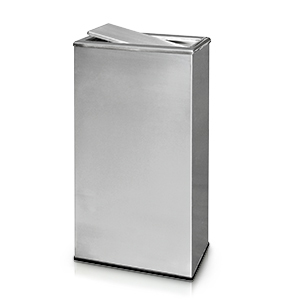 Made with at least 15% recycled content this environmentally friendly receptacle is constructed of heavy-gauge steel. Includes a removable 14 gallon galvanized liner with handle for easy maintenance. Rubberized guard on base edge protects the floors and keeps unit securely in place.